In a small bowl mix together the salt, sugar, garlic powder, and onion powder. Rub the spice mixture over both sides of the chicken. Add chicken to preheated grill pan and cook on each side 4-5 minutes depending on the thickness of the chicken. This was so easy to make and SUPER delicious! I have a small DeLonghi indoor grill, and I made the chicken on that. My mom and husband both raved about this chicken and my mom went home with the recipe to try out on my brother and sister! Tha’s great to hear Rebecca! 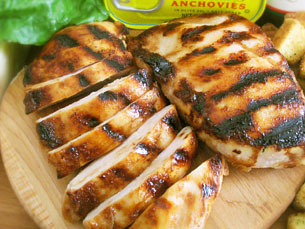 Grilled chicken is a really tasty, quick and healthy dish to cook for dinner! I am confused about chicken breasts. If I have a whole uncut chicken, is that one breast or two? Or is it two breast halves? Is a breast halve commonly called a breast as in boneless, skinless chicken breasts? I just read a recipe that called for 4 chicken breast halves. Does that mean use two chicken breasts (as you use in your grilled chicken video) and cut them in half? So, what is a whole chicken breast? What is a half chicken breast? Can you clear up my dilemma? Thanks! You are so right, recipes can be very confusing! A whole chicken has two breasts. Yes it took 2 whole chickens to get those four breast halves. One of the primary sources of confusion is that when a recipe says 4 chicken breast halves, they really mean four chicken breasts (from two chickens). Check to see how many servings your recipe says that it will make. If it says 4 servings and it calls for 4 chicken breast halves, your recipe is probably just asking for you to use 4 chicken breasts (from 2 chickens). Thanks Kathy! They came out wonderful! How would you do this cooking for one? Grill all chicken breasts and freeze, and then heat as needed (cooking all at once)? or freeze the uncooked chicken breasts, and then thaw and grill as needed (cooking one by one)? I would freeze the uncooked chicken breast, and then thaw and grill as needed. Every time I have ever tried to re-heat (cooked-frozen-thawed-reheated) chicken, the texture turns rubbery. Cooking was my main field of ignorance at the age of 37. And early this morning,I discovered your website. And whooooaaaa!!! At least, your explanations were more informal and less boringly scientific as they’re always doing it here in France. The next following days, I’ll do your other video recipes. T H A N K Y O U for getting me out of the darkness where I was trapped in in the field of cooking. Big hugs and wish to benefit more and more from your simply explained but valuable advise and recipes. Thanks KB for your kind words and good luck developing your cooking skills! -For the stove setting, you should probably set it to ~2.5 I had it around 5 at first, but then the surface of the chicken got burned. I had no idea since this was not addressed in the video. -You should probably use a grill pan instead of a frying pan, because I used a frying pan and whole splotches of the chicken were burned instead of just a few stripes. -You don’t need to rub in the spices with your hand. What I did was this: after flattening the breasts and removing the saran wrap, I sprinkled the spices on the shiny side (which was up) medium heavily. Then I moved the breasts to the pan (shiny side down) and then washed my hands, and then sprinkled the rest of the spices on the other side of the breasts while they were grilling. Doing this will save you several hand washes. Congratulations Rufus! I am so proud of you for giving grilled chicken a second chance! Getting to know the setting of your particular stove is very important. Not all stoves are the same. I hope you enjoy your grilled chicken! Kathy, I just wanted to say thank you so much!! I’m embarrassed to admit I’d gotten to the ripe old age of 34 without learning how to cook. I tried this grilled chicken recipe a few days ago (I bought a grill pan especially!) and I couldn’t believe how easy it was. Yours is the first website I’ve found that has such clear and easy instructions. I feel as if something’s been demystified! I’m determined to keep cooking and learning. Congratulations! I wish you the best of luck developing your cooking skills. I promise you that there is no trick photography with any of my videos or recipes. What you see is what you get! You can grill chicken indoors! This video on making grilled chicken will guide you every step of the way. No barbecue needed for this delicious grilled chicken recipe. Enjoy!